Background: Surgical site infections (SSI) are seen in up to 5% of patients after appendectomy for acute appendicitis. SSI are associated with prolonged hospital stay and increased costs. The aim of this multicenter study was to identify factors associated with SSI after appendectomy for acute appendicitis. 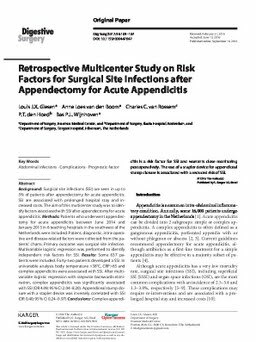 Methods: Patients who underwent appendectomy for acute appendicitis between June 2014 and January 2015 in 6 teaching hospitals in the southwest of the Netherlands were included. Patient, diagnostic, intra-operative and disease-related factors were collected from the patients' charts. Primary outcome was surgical site infection. Multivariable logistic regression was performed to identify independent risk factors for SSI. Results: Some 637 patients were included. Forty-two patients developed a SSI. In univariable analysis body temperature >38°C, CRP>65 and complex appendicitis were associated with SSI. After multivariable logistic regression with stepwise backwards elimination, complex appendicitis was significantly associated with SSI (OR 4.09; 95% CI 2.04-8.20). Appendiceal stump closure with a stapler device was inversely correlated with SSI (OR 0.40; 95% CI 0.24-0.97) Conclusions: Complex appendicitis is a risk factor for SSI and warrants close monitoring postoperatively. The use of a stapler device for appendiceal stump closure is associated with a reduced risk of SSI.